Nino Parker, who lives in a camp on the E. 12th Street Remainder Parcel near Lake Merritt said he doesn't want to move. The closure of homeless camps around Lake Merritt resumed this morning as a small group was ordered to pack up their belongings and tents and vacate the pathway under the 12th Street Bridge near the estuary channel. 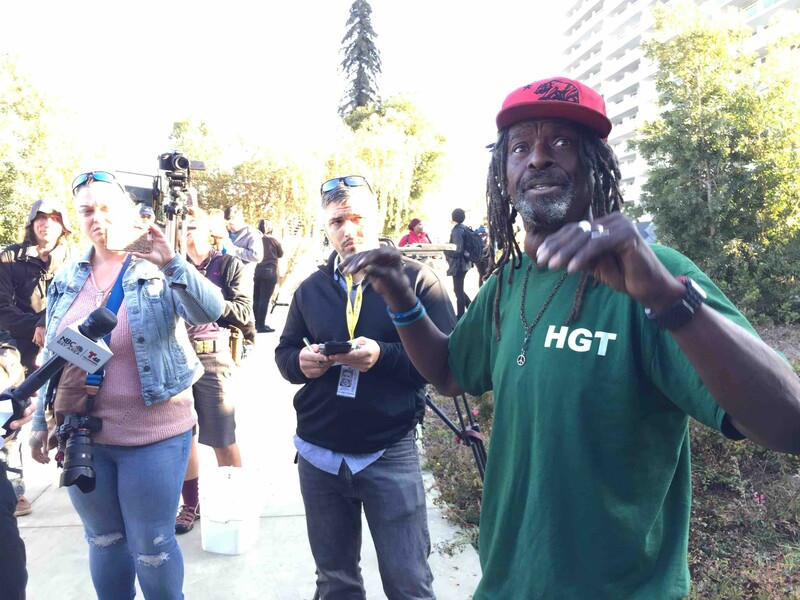 Some of the homeless residents expressed frustration with the city and said their constitutional rights are being violated because Oakland doesn't have enough shelter beds for its large and growing unsheltered population. There are an estimated 1,902 homeless people in Oakland, according to the most recent count, conducted last year. But city officials maintain that the closure of camps around Lake Merritt is legal and necessary. "It's time to clean up around the lake," said Karen Boyd, a spokesperson for City Administrator Sabrina Landreth. Joe Devries, an assistant city administrator who coordinates the city's response to the homeless crisis, said that today trash would be collected by public works crews, and that no one would be forcibly ordered to leave their campsite without also being offered a space in the city's new Tuff Shed camp erected nearby on the Kaiser Auditorium's parking lot. But Nino Parker accused the city of violating homeless people's rights. Parker, who lives in a camp on the nearby E. 12th Street Remainder Parcel, added that the city's homelessness crisis is resulting in the displacement of Black people, who are disproportionately harmed by Oakland's high cost of housing and other forces that push people onto the streets. "This is a Black issue," Parker said while standing near the homeless camp being closed today. "I'm seeing everybody's in charge of us, but us. We're dwindling down here." 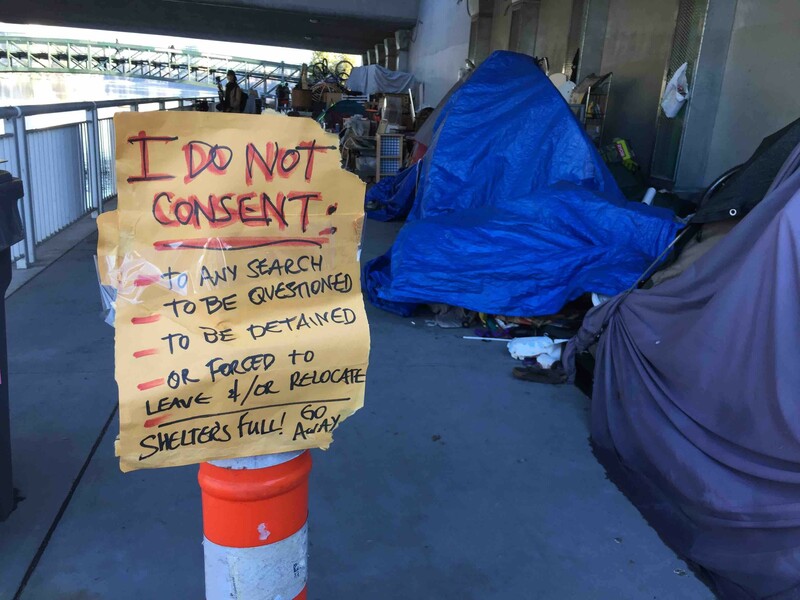 On the pathway in front of the camp, homeless protesters and their allies placed signs reading: "I do not consent to any search, to be questioned, to be detained, or forced to leave &/or relocate, shelter's full! Leave me alone." Some homeless residents living under the 12th Street Bridge do not want to move or participate in the city's Tuff Shed program. They also posted printed copies of decision in the recent Martin v. Boise Ninth Circuit Court of Appeals case in which the court ruled that cities can't criminalize camping and other life sustaining activities unless they are offering a viable shelter alternative to all of their homeless residents. The court said that banning camping and ordering homeless people to leave without offering shelter alternatives amounts to cruel and unusual punishment in violation of the 8th Amendment. Devries said this doesn't apply to what Oakland is doing because the city is offering space in the new Tuff Shed camps to any and all people who are being ordered to leave camps around Lake Merritt. Several candidates for city council and mayor also showed up at the homeless camp today to show solidarity with the unsheltered, they said. Carlos "Kenzie" Smith, who is running against Abel Guillen and Nikki Fortunato Bas for the District 2 City Council seat, said he opposes the closure of homeless camps due to the fact that there aren't viable shelter spaces for people. He said he believes that the Tuff Sheds are unsafe and unfit for many of the homeless, and that the self-organized camps should be respected and provided more resources by the city. Bas was also present at the camp today, while Guillen was not. 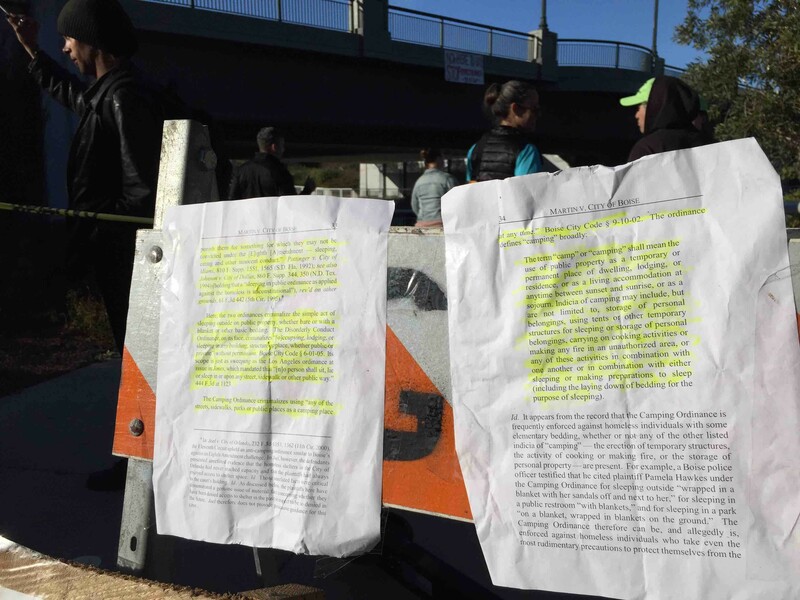 Camp residents and activists posted excerpts from the recently-decided Martin v. Boise case outside the camp to argue that camp closures are a constitutional rights issue. Cat Brooks, Saeed Karamooz, and Jesse A.J. Smith, who are all running against Libby Schaaf in the mayor's race this year were also at today's protests of homeless camps closing. Each of them has criticized the city's response to the homelessness crisis, saying that not enough city resources are being allocated to help unsheltered residents. But Devries said that the city has expanded its shelter spaces and other services over the past year. In addition to creating three Tuff Shed camps, which can house 120 people at any given time, the city also recently purchased an old SRO building on West Grand Avenue that will be transformed soon into a shelter and services center. The city also recently announced a $9 million pilot program called Keep Oakland Housed that is designed to provide low-income renters with assistance so they can avoid being evicted or otherwise displaced and pushed onto the streets.